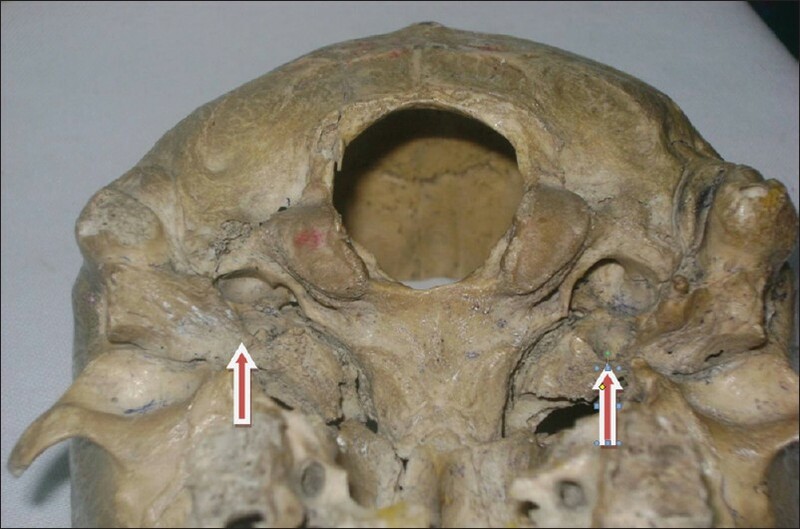 The morphological variants of skull foramina have aroused the curiosity of various research workers for many decades because of their clinical, surgical, anthropological, and racial significance. The compartmentalization of the foramen could be the logical reason for compression on the structures passing through it, specially the last four cranial nerves, causing varied symptoms grouped as jugular foramen syndrome (Vernet's Syndrome). Most of the time these bridging patterns are not evident in a skull specimen. The present study set forth to assess the incidence of size variation, bridging pattern, and associated accessory foramen of a jugular foramen. A total of 56 dry human adult skulls were examined. The skulls were of North-Indian origin. They were procured from Department of Anatomy of Santosh Medical College, Ghaziabad, UP. The foramina were observed macroscopically by the naked eye and with help of magnifying lens. The measurements were taken with help of Vernier Calipers. The size differences on the right and left sides were analyzed. The presence or absence of bony bridging was assessed and associated accessory foramina in this region were also observed. All the observations were recorded and results tabulated. The jugular foramen was larger on the right side in 53.5% of skulls and on the left side in 7.1% of cases [Table 1]. In the remaining (39.4%) it was equal on both sides [Figure 1]. 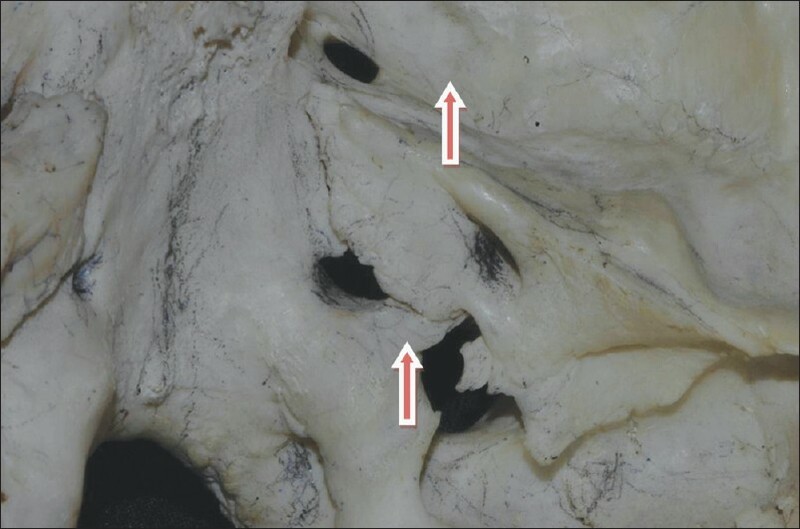 The incidence of bony bridging of a foramen revealed the presence of septation in 17.8% skulls on the right side and in 14.3% skulls on the left side [Table 2]. The classical description of tripartite septation was seen in 13% skulls bilaterally [Figure 2]. Incomplete septation was always seen unilaterally [Figure 3]. It was obvious on the right side in 7.1% skulls and on the left side in 4.3% skulls only [Table 3]. The opposite sides of these six skulls did not even show the presence of any spine or tubercle like elevation. In 3.6% skulls, an additional accessory foramen was observed in the posteromedial wall of the jugular foramen on the left side only. This foramen was found to be communicating with the posterior condylar canal as observed by passing a thin probe through it. A Glomus jugulare tumor grows in and around the jugular foramen. This is the region where the jugular vein, 9 th , 10 th , and 11 th cranial nerves exit from the skull. These tumors cause compression of the structures within the foramen which leads to loss of hearing and paralysis of lower cranial nerves. A complete otological and neurological examination must be done keeping in mind the complex anatomy of a jugular foramen. The frequency of bridging pattern was more on the right side. The course of cranial nerves within the foramen presents many anatomical variations, depending upon the bridging pattern and its types. Tekdemir et al,  observed no partitions in their studies while Ekinci et al,  found bony bridging in 20% and tripartite foramen in 0.7%. Hatiboglu and Anil  (vide supra) studied 300 Anatolian skulls and observed complete septation on the right side in 5.6%, on the left side in 4.3%; partial septation on the right side in 2.6%, on the left side in 19.6%. Patel and Singel  studied the Indian Saurashtra region population to observe complete septation on the right side in 23.1%, on left side in 17.6%; partial septation on the right side in 49.5%, on the left side in 59.3%. This observation went in a wide difference with the present study suggesting racial factors involved in bridging patterns. None of the previous studies observed bilateral complete septation of the foramen. Glomus jugulare tumors are found in the tunica adventitia of jugular bulb beneath the floor of middle ear or in relation to the tympanic branches of glossopharyngeal and vagus nerves in the middle ear. The compartmentalization may accentuate the clinical presentation of the glomus tumor. In early stages such patients visit an ear, nose, and throat surgeon, whereas in later stages patients with large intra-cranial extensions approach neurosurgeons. In addition to the above findings an accessory foramen was found in the posteromedial wall of the jugular foramen communicating with posterior condylar canal. This may provide a potential source of communication of extra-cranial veins in the occipital region with sigmoid sinus. This channel can cause spread of infection from the region of scalp to intracranial venous sinus, leading to thrombosis. Therefore, the knowledge of complex anatomy of the jugular region is of utmost importance to the ENT surgeons. 1. Williams PL, Bannister LH, Berry MM, Collins P, Dyson M, Dussek JE, et al. Gray's anatomy. 38 th ed. Edinburg: Churchill Livingstone; 1995. p. 567. 2. Rucker JC. Cranial Neuropathies. In: Bradley WG, Daroff RB, Fenichel GM, Jankovic J, editors. Neurology in clinical practice. 5 th ed, Ch 74. Philadelphia, Pa: Saunder's Elsevier; 2007. 3. Woodhall. Anatomy of the cranial blood sinuses with particular reference to lateral. Laryngoscope 1939;49:966-1010. 4. Browder J, Kaplan M. Cerebral dural venous sinuses and their tributaries. Spingfield: Thomas PADGET, Great Britain 1976. 5. Ekinci N, Unur E. Macroscopic and morphometric investigation of the jugular foramen of human skull. J Anat 1997;72:525-9. 6. 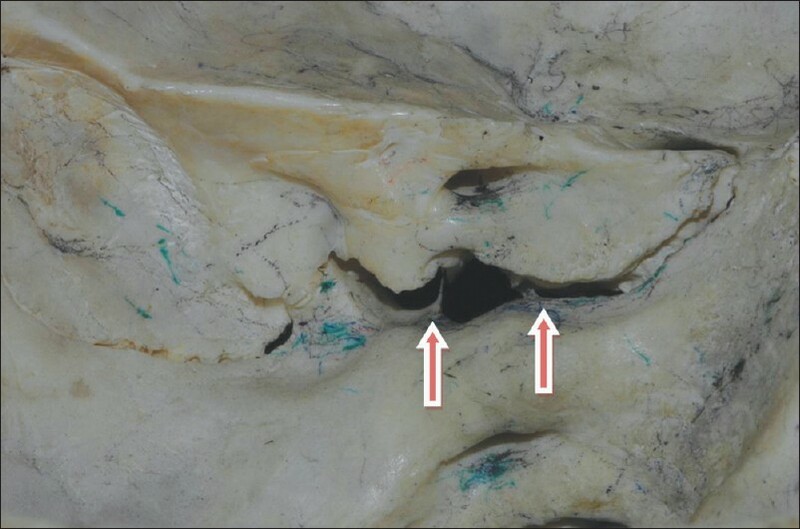 Wyoscki J, Sharifi M. The occurrence variation and diameter of human condylar canal in relation to jugular foramen. Folia morphologica warsz Poland Feb 2006. 7. Hatiboglu MT, Anil A. Structural variations in Jugular Foramen of the skulls. J Anat 1992;180:191-6. 8. Berge JK, Bergman RA. Variation in size and symmetry of foraminas of skull. Clin Anat 2001;14:6. 9. Tekdemir, Tuccar E, Aslan A, Elhan A, Deda H, Ciftci E, et al. The Jugular foramen comparative radio- anatomic study. Surg Neurol 1998;50:557-62. 10. Patel MM and Singel TC. Variations in the structure of the human skull in Saurashtra region. J Anat Soci India 2007;56:34-7.